So with this "less is more" value in mind I'm going to start a series of posts about products that many photographers offer and just tell you straight up if it's going to be worth it in the long run. If the item isn't beautiful and doesn't stand the heirloom test of time, then I'm doing my clients a favor by simply not offering trend items. My new photography product offerings will be narrowed down to luxurious treasures that can only be purchased through a professional photographer. Items that will matter most to you 25, 50, 100+ years from now. First up are "Photo Cubes." 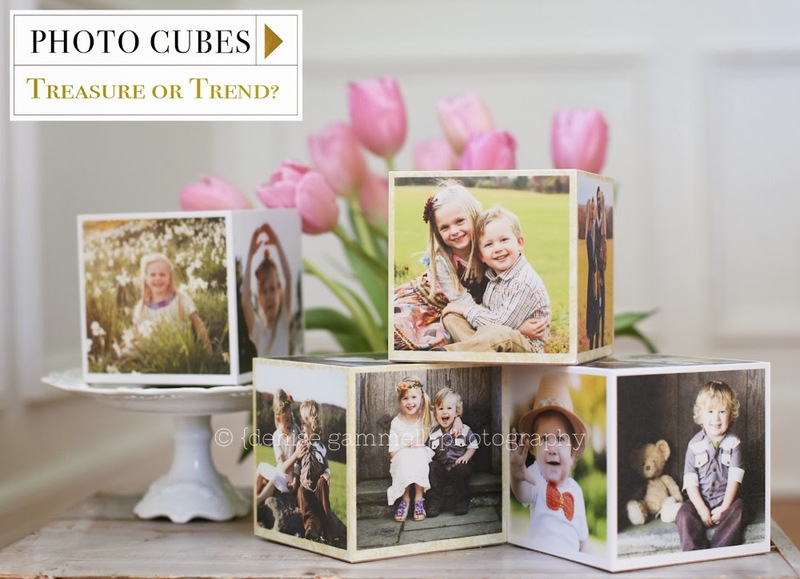 These are 4" cubes that have a laminated photo adhered to 5 wooden sides. I have never had these on my product offerings list before but thought I'd order some from one of my professional photography labs just to see what they are like. They are pretty cute, and my kids played with them for a few minutes stacking them on top of each other. I did notice after my little guy dropped one that the edge did get a tiny bit banged up. These are going to get a lot of handling since you really have to pick them up to see all the sides, so a dent after one drop tells me these won't last but a few years. Great for an office or a kids room. After seeing that Shutterfly offers Photo Cubes for less, this one is a no-brainer. It does not meet the treasure test so these won't make my new luxury heirloom-only photography product listing. Up next with "Treasure or Trend?" are my new Heirloom Albums. I'll give it away now that these definitely are treasures, but I can't wait to show them off with my own images inside. Remember when I shared how I searched through hundreds of various albums for the very best during a professional photographer conference? Well I just finished designing my very own. They should arrive soon from my professional album company and I know you are going to absolutely love these. Beautiful photos, I love it. I wish I cant take those beautiful photos.